Compliments of my friend, Tamara Carter. Quinoa is packed with protein, fiber and iron. Try these creamy cookies to sneak some of this superfood into your diet. In a small bowl, combine the peanut butter, applesauce, honey, vanilla and salt. Add the rest of the ingredients and mix until combined. Spoon rounded tablespoons of cookies on a cookie sheet lined with parchment or wax paper. Place in the freezer to set, about 20 minutes. Enjoy! Blend everything together very, very well. (I used a Vita-mix for this.) Pour into a prepared pie crust or springform pan–this pie can easily be crustless!–and freeze until firm. (If not using the coconut oil, just chill in the fridge instead.) Pie should be kept cold; I keep it in the freezer. Just thaw before eating, and the mousse-like texture will come right back! If you want a deeper-dish pie, use: 1 1/2 c peanut butter, 4 1/2 bananas, 1 tbsp vanilla, a little over 1/8 tsp salt, 1/4c plus 2 tbsp coconut oil, and stevia to taste or 5 tbsp powdered sugar. Pulse walnuts and macadamias in food processor until coarsely chopped. Chop dates and add to food processor with coconut oil. Process until well blended. Press into tart shells two 4 inch tart shells. Crust should be 1/4″ thick all around. My friend, award-winning celebrity raw food chef, Chef BeLive, shared this customized recipe he made for a private client. Being the gracious person that he is, he shared it on his Facebook page. This was one of many carrot based recipes he created for them and this is the one I’m sharing with you at this time….. Spread 2 TBS coconut evenly in the pie pan. Pulse it (on and off) until it is a crumby and place evenly inside springform pie pan and set aside. Blend extremely well until it’s really creamy then pour in onto crust evenly. Add toping onto the top of cheesecake and create designs if so desired, then place it in the freezer for 4-5 hours to set. When sharing, I highly suggest adding the topping sauce to every piece that gets served. Grind dates and almonds in blender. Add vanilla until sticky and then press into rectangular dish greased in coconut oil. Blend caramel ingredients together and pour over biscuit base. Set in the freezer for 20 minutes. While slice is setting, melt coconut oil for chocolate crunch topping. Add all other ingredients and stir well. Let cool for 5 minutes and then pour topping over slice. Place back in freezer to set again. Cut into small squares to serve. Makes 15. This recipe is compliments of a blog on vitacost.com’s blog site. 1. Place cashews in a glass jar or bowl. Cover with cool water and refrigerate for at least two hours or overnight. 3. Makes about 3 cups. 4. Store in an airtight container in the refrigerator for up to a week. 1. Make it a simple dessert frosting/icing: Add 1 to 2 tsp. vanilla and a pinch of pure stevia powder or a tiny drop of stevia liquid. 2. Fancy recipe? Make it a flavored frosting/icing: Add 1 to tsp. of any of the following–coconut extract,almond extract, maple extract, mint extract. 3. 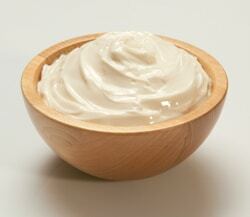 Electrify your sandwich with a spicy/savory cashew cream spread: Add 1 to 1 tsp. of wasabi powderor pepper (black, red or both!). 4. Pizza, anyone? Make a cashew “cheese”: Add ¼ cup nutritional yeast flakes and freshly ground pepper to taste. This recipe is compliments of my wonderful friend, Carol Eastburg. Combine first four ingredients in a bowl and set aside. Put the carob powder in with the honey and mix well. A small whisk works beautifully. Transfer the honey mixture into a large metal bowl and if you need to warm it again, place bottom of the bowl in a sink full of boiling hot water (careful not to get any water in the mixture). Pour the dry ingredients into the metal bowl and use a spoon and/or a hand to make sure it is combined thoroughly. Pour the mixture out onto a piece of wax paper and press it down and out until it’s about half an inch thick. Place a piece of wax paper on top and use a rolling pin to roll out to a consistent thickness. Make it as close to a square or rectangle as you can (use a flat edge (knife or whatever utensil will do the job) get the edges straight/even. Place in the freezer while you clean up. Take out of the freezer and cut into desired size pieces.